The tools in this section were created for personal use or as an experiment. You may, or may not find them useful. Clipboard Imager – A tool for saving and resizing images on the clipboard. Quick Info Tool – Displays information about your system in an Outlook-style popup. It was an experiment in creating a program that requires no user interaction. After a few seconds the popup fades away and the program exits. Psychonauts Audio Ripper – A program to extract the audio from the Pc and Xbox versions of Psychonauts. [This program is no longer updated. Use Psychonauts Explorer instead]. Psychonauts PKG Dumper – Dumps the contents of Psychonauts .PKG archives. 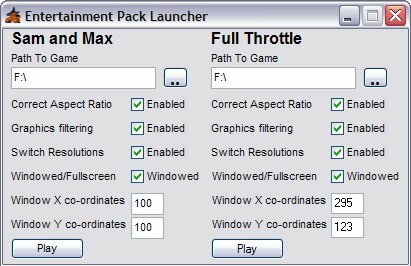 Entertainment Pack Launcher – A utility to run and modify the settings for Sam and Max and Full Throttle in the new Lucasarts Entertainment Pack. After I made this program Aaron Giles, revealed that the settings can be modified in-game. See here for more information.